Nelle Cooper was the secret lover of William H. Bruning. In 1904 he built her a marvelous mansion in the then famous little resort of Winona Lake, Indiana but immediately boarded it up. To the neighbors, there were two intriguing parts of this puzzle - first, Bruning kept the mansion in perfect condition while continuing to court Nelle, and, second, a ghost named Miss Phebe was often seen on the upstairs sleeping porch The resort town spent endless hours trying to figure out why the two didn't marry which culminated in a full page newspaper story by a reporter who traveled all the way down to Winona from Chicago for the scoup. See The Chicago American May 1916 story. The Lost Chloe discovers the reason for both. Unbeknowngst to the neighbors, Nelle and William had a even more intriguing story than could be imagined. In fact, the two had been lovers for almost twenty years already! In 1880 Ellen Cooper (Ellen had several names. William's secret name for her was Nelle which is Ellen spelled backwards, Also, her stage name was Helen or Helene) dropped out of Wellesley College and became an actress with the D'Oyly Carte Company of New York under director Max Figman. By October of 1885 she had moved to the Jules Grau English opera Company still under Figman and they played in the tiny town of Madison, Indiana during the week long grand opening of the new Opera House. During this time, William H. Bruning met Nelle and they became lovers. However, Bruning's parents had made their disapproval of actresses well known (so did Nelle's) and so the relationship remained a secret for many years. Above: Two clippings from The Madison Daily Courier during that fateful week in October of 1895. ...after Catherine's unexpected death in 1889 and then John's in 1891, William's sister Clara and her n'er-do-well husband Copeland soon protested the will and filed several lawsuits against William and the family business. This relationship soured so quickly over the money, that in 1894 Copeland attempted to murder his brother-in-law Williim H. Bruning in Indianapolis beginning a year long media mad circus. At the end of the trial in May of 1895 in which Copeland was exonerated by his wife's scandalous admission under oath, William and Nelle fled in secret to the fledgling resort of Winona Lake Indiana where no one ever uncovered their past. They thought they might be able to make a fresh start. However, there was a further issue. In 1892, Nelle had an illegitimate child by William and raised the child with help from her cousin's nanny Miss Phebe in Indianapolis. 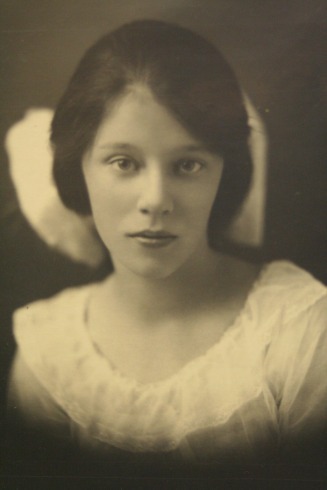 Chloe Ellen Cooper became the only true heir to the Bruning fortune and Nelle was so afraid for her life that she did not even tell William for many years. The Lost Chloe is her story. 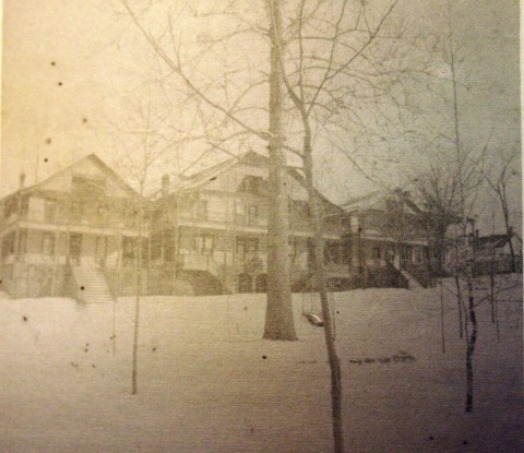 The brand new Swiss Terrace three part chalet Circa 1905 in a snowstorm. Mary Cooper and her daughter Nelle managed this famous inn for William H. Bruning. They fled here to hide from Copeland after he was set free at the conclusion of the 1895 Indianapolis trial for the attempted murder of William H. Bruning. Nelle feared for her life and always hid her relationship with William from his sister.